During your journey to build lean muscle, lose fat and gain a healthy body, the right tool to assess your results will make all the difference. We are fortunate at Evolution Fitness to have one the best tools in the world to provide you with those measurements, the InBody 520. The InBody 520 will provide you with an extremely accurate measurement of your total body composition. This is nothing like the scale in your bathroom or Dr.’s office. Not only does it provide your weight; it also provides you with your total body fat, dry lean mass (bone), and total body water. It further divides the total body water into Intracellular water and Extracellular water. It is important to keep the Intracellular water and Extracellular water in balance to stay fit and healthy. It does not stop there. The InBody analysis will also provide you with your all-important Percentage of Body Fat. Finally, an analysis of the musculature in each limb and trunk is provided. This analysis will show how your body distributes muscle. Through genetics or training there could be imbalances. This analysis will help to give us a clearer picture of where and how your training should be focused. The InBody 520 uses Direct Segmental Multi-frequency Bioelectrical Impedance Analysis Technology to provide the most accurate body composition analysis in the world. What does all that mean? Basically, when you step on the InBody, harmless electrical currents are sent through your body to provide you with an extremely accurate body composition measurement. Low and high frequency currents are used because different parts of your body will react differently to the electrical current. For instance, low frequency currents flow down the external surface of water and cannot penetrate the cell walls. This current will provide the measurement for the Extracellular water. The high frequency current can penetrate the cell walls providing the measurement for the Intracellular water. The majority of body water is Intracellular and found with in muscles and organs. 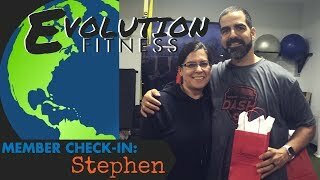 This is a lot of information and all available to you at Evolution Fitness as part of your membership. All you need to do is make your appointment. Then follow a few simple instructions to prepare for the test. Start tracking your success today!